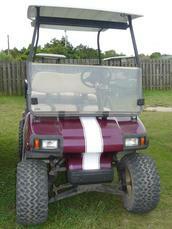 Wheelie Fun Golf Carts is a family-owned and operated business here in Ocracoke, NC. We are local people with family ties to this island for generations. This is our home and where we have raised our family. Our grandchildren are being raised here, too! We have met so many wonderful people who are here vacationing and look forward to meeting you and your families. Our prices are reasonable and we are happy to share our thoughts on where to go & what to see and do. We offer both electric and gas powered carts to suit your needs. 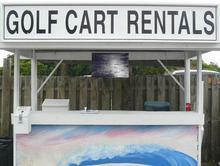 We offer both four and six passenger carts for rent. Each of our carts are personalized - find one to fit your personality! We will gladly provide free pick up and/or delivery of golf carts when needed. We will also be happy to pick you up from the airport if you are flying in. Reservations are welcomed. We look forward to the opportunity to serve you. Let us show you our southern hospitality! The Ocracoke lighthouse, built in 1823, is easily accessible by golf cart! Our rental "office" is located on Hwy 12 at the Gas Station. Traveling South on Hwy 12, we are on the left as you enter the Village. Look for the flags! We offer both electric and gas powered carts. All carts seat 4 - 5 people.